Mugabe’s resignation came after his Zanu-PF party stripped him of leadership over the weekend and introduced a motion to impeach him on Tuesday morning. The motion, deemed “unprecedented in the history of post-independence Zimbabwe” by Parliament Speaker Jacob Mudenda, was seconded to loud cheers and thumping on tables. The parliament then adjourned for a debate. News broke during this interval that Mugabe had resigned. 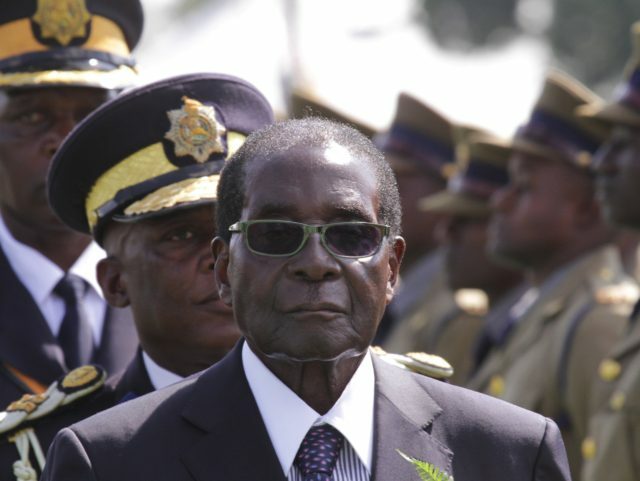 Although the impeachment process technically requires a lengthy investigation, officials spoke of fast-tracking it to remove Mugabe from office in a matter of days. The BBC reports that “lawmakers roared in jubilation and people have begun celebrating in the streets” after Mudenda revealed Mugabe’s resignation announcement. Mugabe was strongly advised to resign by his former vice president, Emmerson Mnangagwa, who returned to Zimbabwe after being sacked by the dictator to clear a path to power for his wife Grace. The articles of impeachment specifically cited Grace Mugabe’s attempt to “usurp constitutional power” as an example of the Mugabes’ lack of respect for the rule of law, along with the “instability” Robert Mugabe brought to the country and the 93-year-old dictator’s advanced age. “I am aware that parliament intends to impeach the president. Parliament is the ultimate expression of the will of the people outside an election and in my view is expressing national sentiment by implementing the impeachment,” Mnangagwa said in a written statement on Tuesday. Mnangagwa is no enlightened revolutionary. Nicknamed “The Crocodile,” he spent his political career as Robert Mugabe’s understudy in racist dictatorship. He knows a few things about threatening the “personal security” of political opponents and inconvenient tribes. CNN quotes British MP Kate Hoey, a longtime critic of the Mugabe regime, describing Mnangagwa as “probably the one person in Zimbabwe who inspires even greater terror than Mugabe.” If the Mugabe terror is truly over, Zimbabweans will be lucky to escape an “even greater terror” to come.